1. By entering the Spring Grand Draw, you agree to be bound by these terms and conditions. 2. The cost of each entry is £1 and tickets can either be purchased in paper form through returning the raffle ticket book, over the telephone through ringing 01628 201 286, or online. Players may purchase more than one entry, and payment must be in advance. 3. Not to be sold by or to anyone under 18 years of age or outside Great Britain (this excludes Northern Ireland, Isle of Man and the Channel Islands). Children with Cancer UK reserves the right to confirm that these criteria are met and any person found not to meet these criteria will not be entered into the Spring Grand Draw and automatically forfeits the right to any prize. 4. The Spring Grand Draw opens at 12.01am on 21 March 2019. All postal entries must be received by 17 May 2019. Online and text entries close at midnight on 22 May 2019. All winners will be selected at random by computer software on 31 May 2019 from all valid entries received by the closing date. Any money received after the closing date will be used to help fund Children with Cancer UK’s vital work. 5. The winners will be notified within two working days from the draw, using the phone number provided at the time of entry. In the event that contact with the winner cannot be made within a further ten working days or the winner is found not to meet the entry requirements, we reserve the right to withdraw the prize entitlement and award the prize to the reserve drawn at the same time as the original winner. 6. There are twenty three prizes on offer. If you buy the ticket from a friend, you both split the prize between you, winning £12,500, £2,000, £1,000, or 20 x £50 runners up prizes each. If you buy your ticket from your own pack, buy the ticket online, or via SMS, you win both halves of the prize so that first prize is £25,000 cash. The second prize is £4,000 cash. The 3rd prize is £2,000 cash. There are also 20 x £100 cash prizes to be won. 7. All profits from the Spring Grand Draw go to Children with Cancer UK. 8. Children with Cancer UK is not responsible for any delays in bank payments. 9. Players are responsible for providing and (where necessary) updating Children with Cancer UK with their accurate and up to date contact details. No liability is accepted for: any failure or inability to contact a player because of inaccuracies in contact details provided; loss, theft or delayed receipt of any communication sent by post; delays or failures in software or other systems used by Children with Cancer UK or its External Lottery Manager for the administration of the Spring Grand Draw; or any event beyond the reasonable control of the Charity or its External Lottery Manager. 10. Children with Cancer UK reserves the right to use the winner’s name for promotional purposes. These will only be in summary, for example Mrs Jones from Berkshire. 11. Children with Cancer UK or its External Lottery Manager may (without giving any reason or notice) decline to accept an application, cancel an existing subscription or terminate or suspend the Spring Grand Draw. Children with Cancer UK operate a Complaints and Disputes Procedure which will be made available to customers upon request. 12. The rules are subject to change by Children with Cancer UK or its External Lottery Manager. 14. Children with Cancer UK holds customer funds separate from company funds in a separate account. This means that steps have been taken to separate customer funds from business funds but those funds are not protected if Children with Cancer UK becomes insolvent. This meets the Gambling Commission’s requirements for the segregation of customer funds at the basic level of protection. 15. These terms and conditions are governed by English law. The courts of England and Wales shall have exclusive jurisdiction to hear any dispute or claim arising in association with the Spring Grand Draw or these terms and conditions. 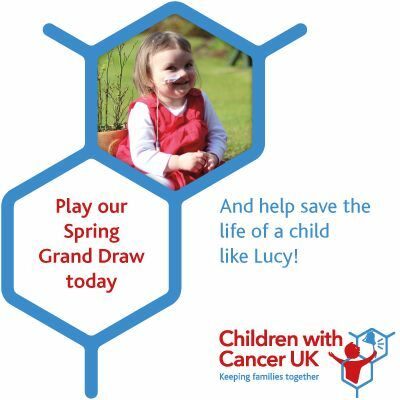 The promoter of the Spring Grand Draw is Children with Cancer UK (company number: 04960054) (registered charity number: 298405). Responsible Person: Pippa Ball, 51 Great Ormond Street London WC1N 3JQ. 16. To enter the online raffle an entrant must self-certify that they are the required age to play. A confirmation email will be sent to the entrant confirming their numbers in the draw and thanking them for their participation. Random age verification checks are carried out at regular intervals. If an entrant is found to be under the required age their payment will be returned and they will not be entered into the draw. 17. In order to promote responsible gambling, it is recommended that no more than 60 chances are to be purchased per person for the Spring Grand Draw 2019. 18. Entries must not be bought on behalf of somebody else. 19. Material changes to this raffle are not predicted to happen, but in the event that this occurs you will be notified by email 14 days in advance of any changes. The Children with Cancer UK policy for raffles can be found here. This includes our policy on responsible gambling, underage gambling, fair and open draws and our complaints procedure. If you or a family member feel that you are experiencing problems with gambling, you can seek advice and support from GambleAware on 0808 8020 133 or via their website begambleware.org.